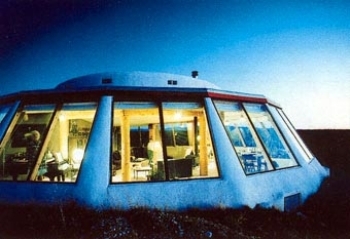 Earthships are the brainchild of American architect Michael Reynolds, who first put the concept into practice in the seventies, during the first oil crisis. Sharp falling energy prices in the 80’s and 90’s restricted the idea for a long time to mostly anarchistic communities and individuals. Recently however, this revolutionary architecture is slowly gaining credibility in other sections of society. Oil prices continue to climb and uneasiness surrounding global warming grows. Moreover, thanks to 30 years of evolution, many of the initial glitches Earthships faced have been ironed out. The house has very thick walls, with a diameter of around one metre. The walls are not made from concrete or bricks, but from piled up car tyres covered with clay. Every tyre is filled with earth and then tamped down with a sledge-hammer. Depending on the climate, two to three walls are surrounded by a heaped up wall, or built into a slope. Combined with a sun lounge on the south side of the building (the north side on the southern hemisphere) the construction provides a natural heating and cooling system. The solar heat that enters the house through the large windows is absorbed by the thick walls. The walls have a large thermal mass thanks to the car tyres and the earth – insulation is extremely effective. During the night and on cloudy days, the heat is then slowly released. The same system cools the house in summer, as the surrounding earth and the car tyres are colder than the open air. Thanks to this natural air-conditioning, the inside temperature varies from 17 to 24 degrees all year round. "No matter how sensible the idea is, building houses with car tyres and aluminium beer cans sounds ludicrous to most politicians"
Using waste materials does not necessarily mean than an Earthship is cheaper than a traditional house – the homes on offer in Brighton will even be slightly more expensive due to the labour intensive nature of the Earthship (labour is taxed much more heavily than use of energy or materials). Although, once the house is built, the extra investment is quickly recovered as there are no gas, water or electricity bills. Building an Earthship yourself with some friends could be very cheap, but is time consuming. The largest Earthships in the United States took almost ten years to build. If you build one on your own, the biggest cost would be the purchasing of solar panels and batteries, followed by the large windows, pumps and filters. Waste materials could be delivered for free, as people have to pay to get rid of them. 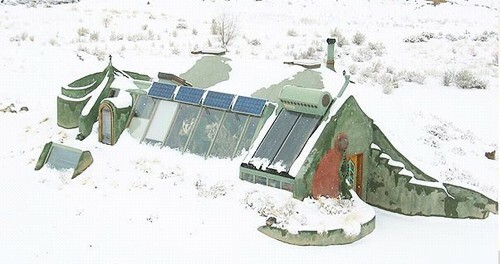 Most Earthships in the US take on an unconventional form. They have fairy-tale like features that remind one of the works of architects like Gaudí and Hundertwasser. But others, like the 16 Earthships being built in Brighton (picture right), hardly look any different from conventional houses. These more traditional forms may help with the general acceptance of this type of building method by the general public.